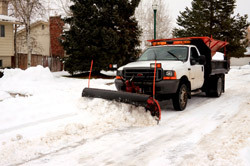 Download a Snowplow Subcontractor Application Today! It’s always smart to plan ahead for snow removal when winter comes around. While snow can be one of the most beautiful things in nature, it can also be a big hassle for business owners. Living in Ohio, you know the dangers than come with excessive and sometimes even minimal snowfall. Some people may do just fine breaking out the old snow shovel or tossing the kid down the street a few dollars to do the job, but there are a large number of situations where neither of these options is available or capable of handling your problem. If your area typically gets a lot of snow, it is very prudent to consider calling for professional snow removal. Professional snow removal is more of a necessity at times than a luxury, especially during the holidays. With clients and customers coming and going through all entrances and exits to your business, hiring a professional snow removal service is well worth the investment. It will not only make your life easier and less busy, but also make a trip to your business safer and more visually appealing to visitors. If you're expecting clients who are elderly or who have very small children, removing snow and ice from your property is a must. Providing a safe and functional environment for your employees and customers during winter weather. Target times for service determined by your needs. We specialize in zero tolerance/no accumulation properties. We only put down premium ice melter on sidewalks they are environment and concrete friendly. Multiple options for de-icing (ice melt, rock salt, pre salt). Snow loading, hauling and removal services. Seasonal pricing or per occurrence rate. Dedicated supervisors for each zone. Dedicated crews for larger properties. Ex. Homeowners associations, Condo associations, larger commercial properties, zero tolerance properties. Hundreds of tons of salt to ensure we never run out. Dedicated snow chasers who work 3rd shift looking for snow and ice to stay ahead of our competition. Call 419-536-9003 or click for exceptional Toledo Snow Removal.